(CNN) -- Researchers have found that rooks, a member of the crow family, are capable of using and making tools despite not doing so in the wild. 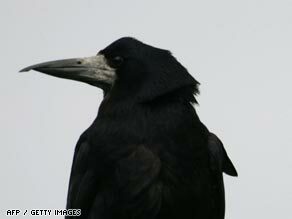 Smarter than the average bird brain: Rooks use tools to get food, a study has found. Scientists from the University of Cambridge and Queen Mary University who conducted the study believe the rooks' ability to use tools are the by-product of a sophisticated form of physical intelligence. "This finding is remarkable because rooks do not appear to use tools in the wild, yet they rival habitual tools users such as chimpanzees and New Caledonian crows when tested in captivity," said Chris Bird, the lead author of the study. The researchers found that not only could they use stones to solve the task, but they were flexible in their tool choice, using and modifying sticks to achieve the same goal. When the correct tool was out of reach, they used another, demonstrating the ability to use tools sequentially. In further tests, the rooks were able to use a hook tool to get food out of a different tube and even creatively bent a straight piece of wire to make the hook to reach the food. "We suggest that this is the first unambiguous evidence of animal insight because the rooks made a hook tool on their first trial and we know that they had no previous experience of making hook tools from wire because the birds were all hand-raised," said Dr Nathan Emery, Queen Mary University of London.